Every woman who wants a thin waist can have one. It all depends on you and your work. Firstly, you have to change your diet. Secondly, you have to add exercise to your daily routine. Today we have prepared a list of tips that can help you lose belly fat and make your waist smaller. The main thing is a healthy diet. You need to eat healthy, well-balanced meals that will nourish your body without leaving excess fat on your belly. You should prepare a diet plan ahead of time for the week. For example: bake or grill a few chicken breasts, hard boil a dozen eggs, buy a few cartons of Greek yogurt, etc . This plan will help you lead a healthy lifestyle and not give in to junk food! Moreover, you should eat in balance. Try to combine foods that contain protein, carbs and healthy fats (piece of whole-grain toast with peanut butter and ½ a banana, full-fat Greek yogurt with berries, veggie sticks and humus). It will keep you balanced and satisfied. Also, you should eat 5-6 small meals during the day. You must be aware that a healthy diet alone will not help you. That is why you should combine your diet with exercise! If you want to make your waist smaller, then you need to add a cardio workout to your daily routine. You can choose the most suitable cardio for trainings: walking, running, dancing, boxing, bicycling, swimming, fitness classes. The thing is to find a cardio routine that you will easily perform and enjoy. You should perform cardio trainings 4-5 days a week. 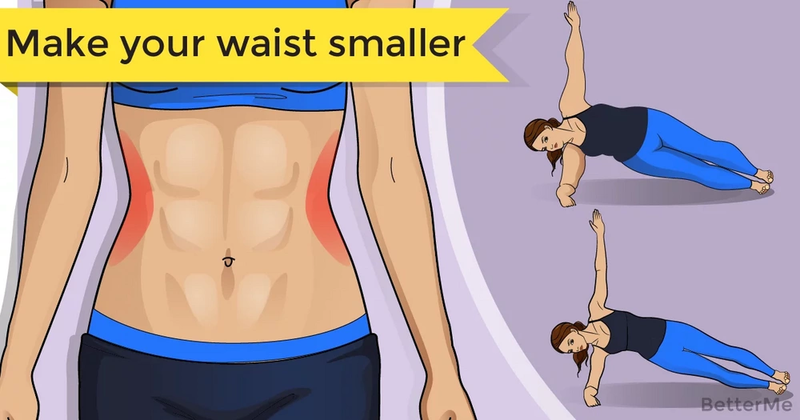 However, there are some core exercises that can help shrink your waist. This core workout include exercises like Pilates 100, Oblique Crunch, Bend Extend Ab Tuck, Side Plank and Bicycle. You should perform 8-10 reps of each move. Don’t forget to drink enough water while performing exercises. The combination of cardio, proper diet and core workout will help achieve the waist of your dreams. Just do it!